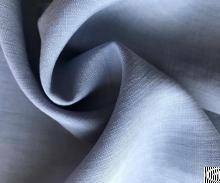 tencel lyocell satin fabric leading a new era of fiber production. Tencel lyocell green fabric as OEKO TEX Certified, is made from wood pulp, pioneer using a breakthrough technology of spinning, which is astonishing the fabrication industry. Moisture management---Compared with other viscose fiber, Tencel fiber has an outstanding ability of absorption. According to the test, polyester fiber can zero absorb moisture; AndTencelfiber can absorb 50% more moisture than cotton.Skin friendly---skin is the largest breathing part of human body. Our skin is like a membrane protecting our body from virus and bacteria, in the meantime, skin can adjust body temperature and maintain body moisture in balance. Tencel fiber with softer construction in the surface, make skin feel more comfortable. According to the research, Tencelfiber with smooth and abundance surface, while wool fiber surface is like squama, cotton fiber surface is uneven and rough; Tencel is the best choice for skin allergists. Smooth construction and good moisture absorption bring much healthy life.Natural protection from bacteria---When talking to health and hygiene, Tencelfiber has natural characteristics bring us more added value. Bacteria hardly raise in theTencelfiber, as this fiber can adjust temperature and moisture, which is the eco-friendly way to restrict bacteria growing. When people sweating, the fiber absorbs the liquid into fiber directly, so very less liquid left on skin surface, avoiding bacteria growing. What�s more, Tencelfiber is totally natural, and contains no toxic chemical addiction, however, to synthetic fiber, the bacterial growth rate is 2000 times faster thanTencelfiber. We strive to maintain and create more eco-fashion fabrics, to satisfy our customers' personalized demand. Different styles andTencelblend fabric fromTenceldenim to soft like silk, and peach skin hand-feel, etc, these new improved and stable qualityTencelfabrics will always in stock.